La Plagne is a vast ski resort with an enormous vertical drop of 6,562ft (2,000m), double that of Aspen, for example. One of Europe's largest holiday resorts, La Plagne is made up of 10 different 'villages', six purpose built and four traditional, that are connected by public conveyances and a lift system. As such it can boast the largest ski area of any single resort in the world, and its linked trail system (Paradiski) with Les Arcs means there are now 261 miles (420km) of trails and 144 ski lifts. The high altitude La Plagne resort centres on apartment life; there are few hotels and its convenience makes up for its lack of charm. The highest complex at Aime La Plagne is 6,890ft (2,100m) and is considered to be the most convenient holiday accommodation, with many of the best apartments. The lowest mountain village, at 5,906ft (1,800m), is the neo-Savoyard Plagne 1800. The largest complex, with the liveliest holiday atmosphere, is the original Plagne Centre, one of the first villages in Europe to be built to cater specifically for the skiing season. The lifts are near to the accommodation and visitors can generally ski to their door. For beginners and intermediates, La Plagne is the best of the European ski resorts. 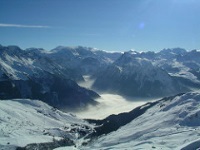 As a high-altitude resort, the La Plagne snow cover is reliable, particularly up on the Bellecôte Glacier (10,663ft/3,250m), and the terrain is extensive. La Plagne is one of the best resorts for beginner and intermediate skiers and boarders as far as prepared trails go, but there is also plenty of off-piste terrain and challenging runs from the glacier for experts. The scenery and views are stunning and can be enjoyed by all levels from the highest point, where trails for all abilities will lead even novice skiers safely down again. Intermediates will find more than enough to believe they are in skiing heaven, and beginners are well catered for with nursery slopes adjacent to all the villages and novice runs between centres. There are 17 ski schools and numerous skiing areas for children. Each complex of the purpose-built sections of La Plagne has holiday apartments, with stores and ski shops all interconnected by tunnels and walkways. The underground passages are reminiscent of a subway shopping mall and shoppers will find clothes and accessories, bookshops, gifts, jewellery and handicrafts. There are more than 50 restaurants to choose from in the La Plagne resort, most of them in Plagne Centre. There are several nightclubs in the La Plagne resort, as well as cafés and coffee houses that offer live music, karaoke and concerts to enjoy on holiday. Besides the fantastic skiing and snowboarding, other holiday activities in La Plagne include ice skating, dog sled rides, an Olympic bobsleigh piste, ice climbing, a night skiing slalom stadium, cross-country skiing and snow-shoeing. Hang gliding and paragliding are also available. Some complexes offer outdoor heated pools, fitness centres, ten-pin bowling and electronic golf. The La Plagne resort is not the image of a traditional village, with many high-rise buildings and purpose-built complexes. Waiting times at lifts can be lengthy.